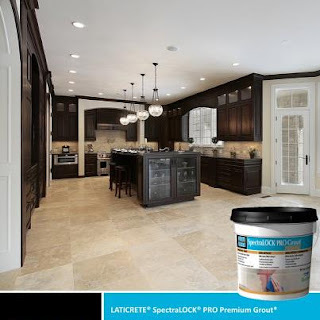 "LATICRETE, a global leader in Tile and Stone Installation Systems, presented their latest products and innovative features in collaboration with CarpetIsle Flooring America. 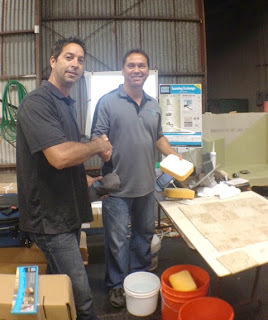 A big mahalo to LATICRETE, Technical Sales Rep. Kevin Coronas and CarpetIsle Flooring America for demonstrating the latest products from LATICRETE. Contractors, Builders, and other industry leaders were in attendance to experience the latest products, refresh our knowledge of exisiting products, and ask follow up questions. 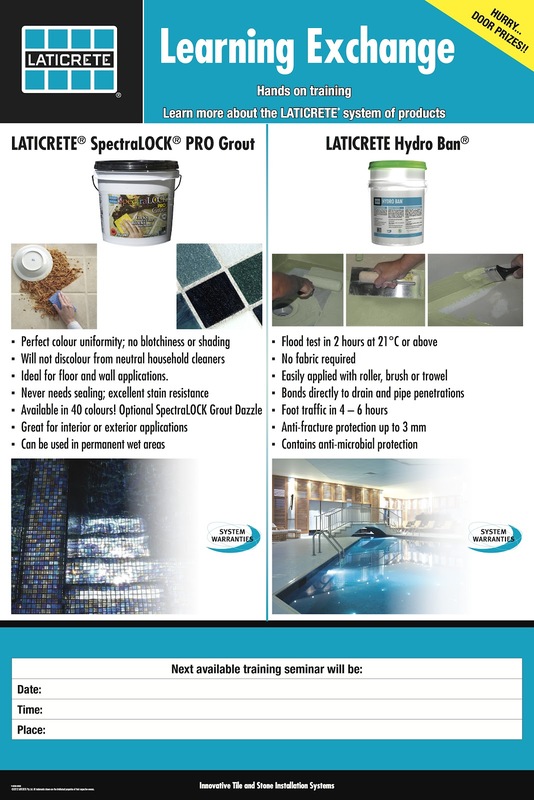 Waterproofing and Crack Isolation Membrane, the latest HYDRO BAN® Presloped Shower Pans and Preformed Shampoo Niches & Preformed Shower Seats. 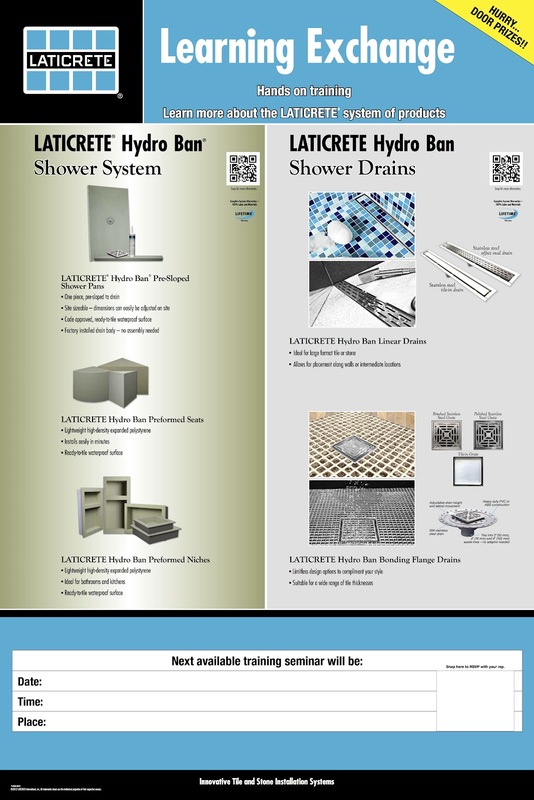 One of the interesting products we at Tile Styles are looking forward to implementing is the Linear Drain Systems and HYDRO BAN® Drain Systems that feature the latest designs and tiled-in appearance to make a virtual drain-free appearance. 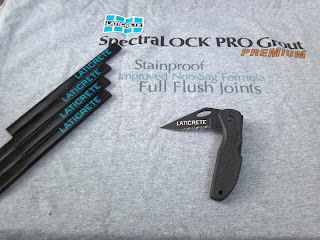 Thanks to LATICRETE and CarpetIsle Flooring America, we all work together to provide the most up-to-date, reliable installations in the industry and provide the best products and services to the end user - Homeowners and Business Owners." The newly released 2012 International Green Construction Codes (IgCC) include new energy conservation requirements that will impact the installation and specification of exterior adhered tile & stone veneers. 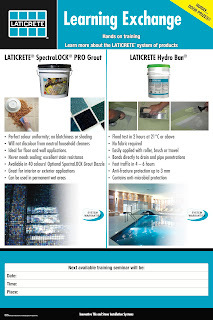 Air leakage – the use of LATICRETE Waterproofing Membranes (LATICRETE® Hydro Ban, LATICRETE 9235 Waterproofing Membrane and LATICRETE Air & Water Barrier) can be used to effectively reduce air leakage in building envelopes. 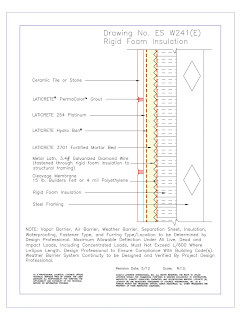 Appendix A – Normative Appendix A (ANSI/ASHRAE/IES Standard 90.1) – Prescriptive Building Envelope Tables – these tables include the minimum R value requirements for various wall constructs (both residential and commercial) to demonstrate compliance with the new energy codes. 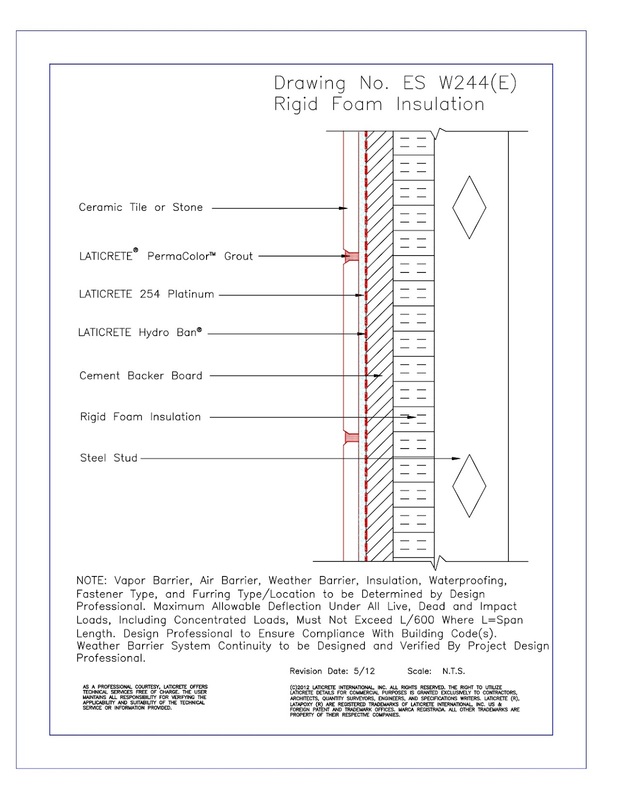 Appendix B – Normative Appendix B – Prescriptive Continuous Air Barrier – Building Materials that demonstrate compliance with these requirements must have an air permeability not to exceed 0.004 cfm/ft2 under a pressure differential of 0.3 in. water (1.57 lb. /ft2) [0.02L/s.m2 under a pressure differential of 75 Pa] when tested in accord with ASTM E2178. LATICRETE HYDRO BAN and LATICRETE Air & Water Barrier pass this requirement. 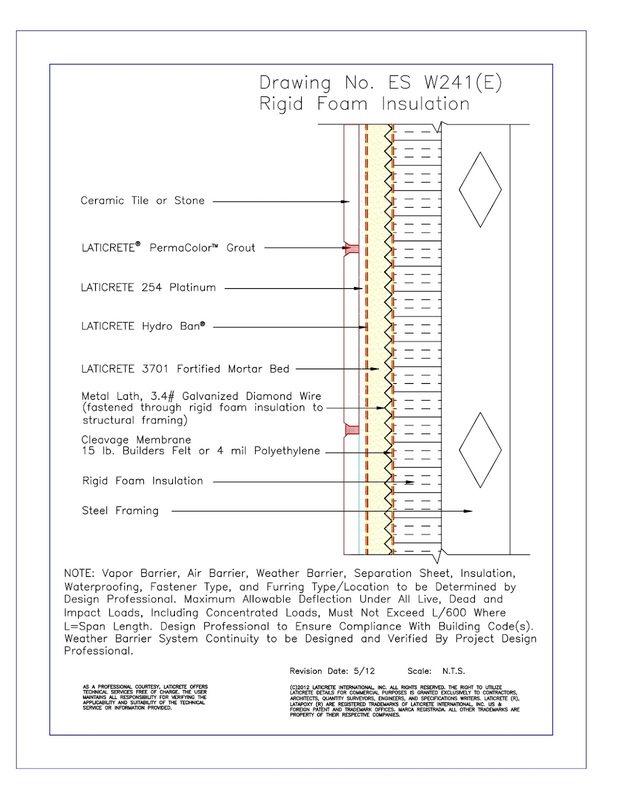 With these new requirements potentially in play for adhered exterior veneer projects; please closely examine the images above of two of several exterior veneer options that include a layer of rigid foam insulation which in many cases would satisfy the energy requirement. However, bear in mind that the project design professional / engineer must make the final R-value contributions, total energy calculation and decide how to incorporate the various building envelope materials into the design of the veneer system. 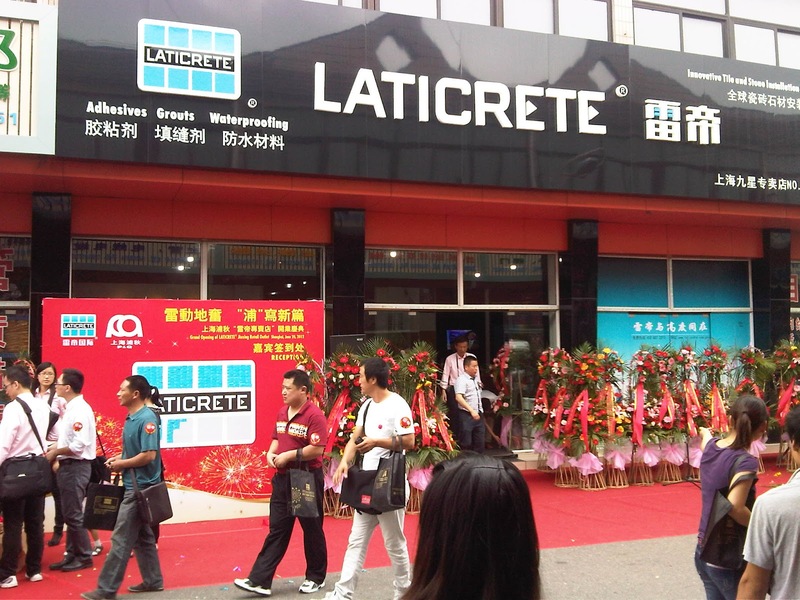 The tallest buildings in the world count on Laticrete for tile & stone installations ! 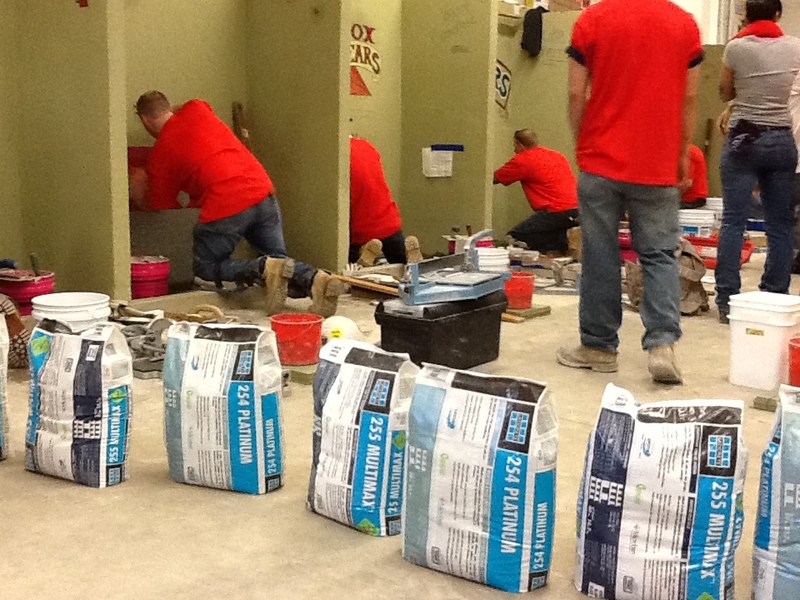 "We are pleased to be part of Boston's BAC Local 3 Apprenticeship Program again this year. The program has been a success in Boston since the early 90's, helping hundreds of young men and woman learn a rewarding trade that will last a lifetime. The apprenticeship program starts with a 10-week pre-job training course and also requires 5,000 hours of on the job training under the watchful eyes of veteran journeymen. 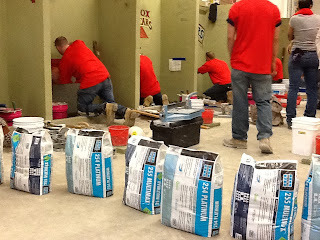 The photos above are from the annual Apprentice Contest at the BAC Local 3 Training Center in Boston. The tile-setting contest had the apprentice tile setters preparing a wall to accept ceramic tile. 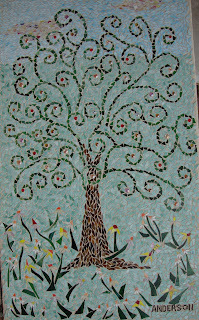 They then installed a combination of 4-1/4" x 4-1/4" ceramic tiles in various colors with a band of tile cut in a diamond shape. After completion of the wall, the apprentices were required to build a mud pan that included a ½" pitch to the drain using 2"x 2" mosaic tile on a mud floor. 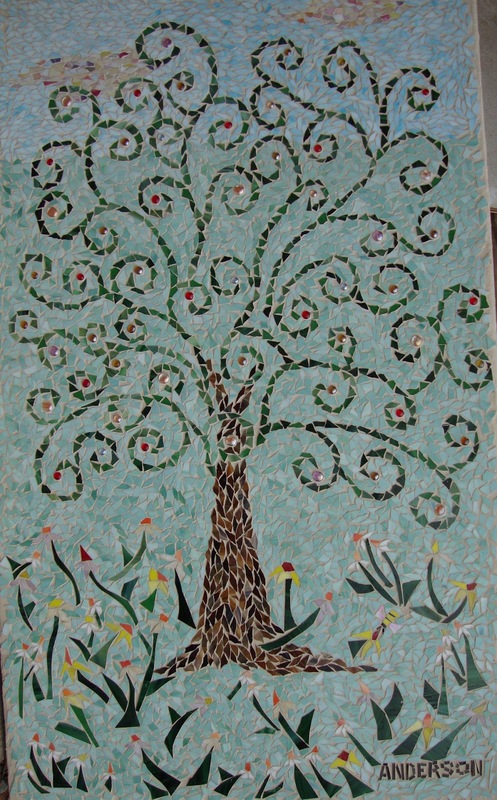 The mosaic tile had to be cut precisely to fit around the circular drain. 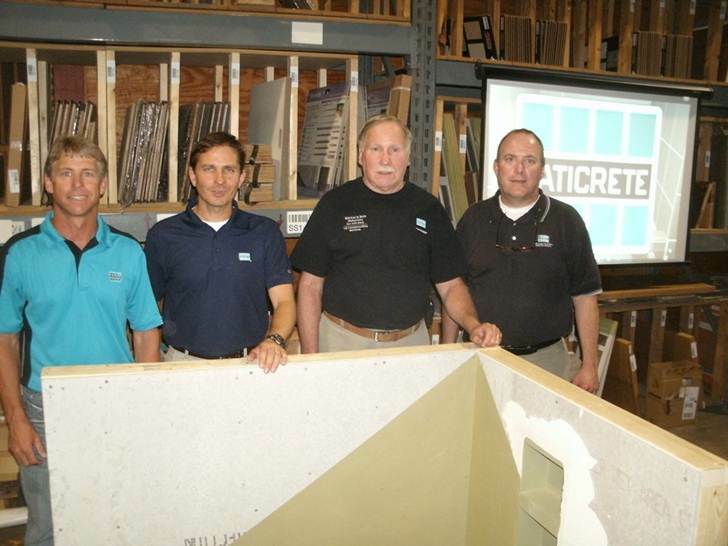 The judges rated the contestants on overall layout, alignment, proper pitch as well as the precision of any cut tile. 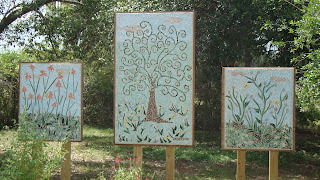 Some of the contestants will be chosen to compete nationally as well. 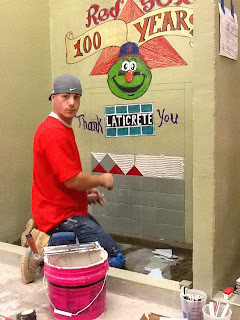 The theme as you can see in the pictures is celebrating the Boston Red Sox 100 year anniversary with LATICRETE's HYDRO BAN creating Boston's Green Monster!" The Grout is part of what we see on a tile or stone installation. Consider "Stainless Grout !" Dad would love this. However, he wouldn't be surprised; he saw the future. 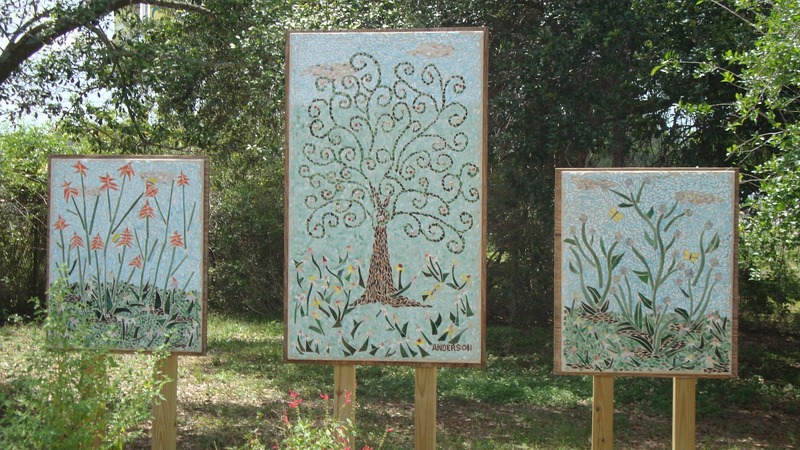 3 Mosaics for the newly established Medicinal Gardens at the University of South Florida Botanical in Tampa FL"
An expanded library of 7 Tile & Stone Specialized Application Areas Technical Design Manuals are now available as eBook for the Amazon Kindle eBook Reader. 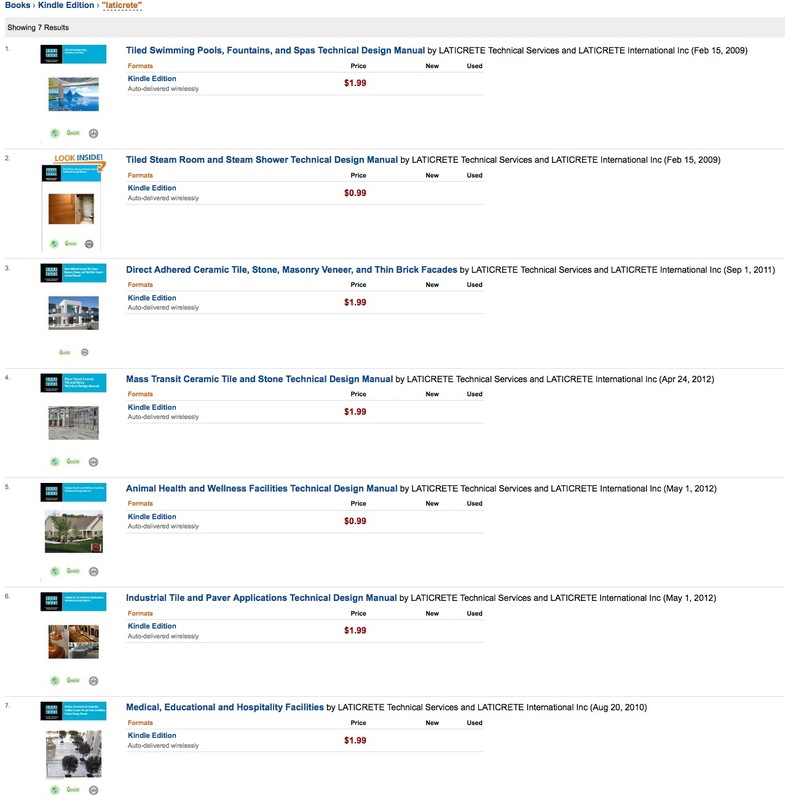 Visit the Amazon Kindle bookstore to download or click here for more info or to download these books in pdf file format. Our PR Guy ? In 1985 ! "Here is one from the archives. In 1985, we were hired by one of the leading printers in Chicago to do a complete promo program. The theme was "OUT-OF-THIS-WORLD COLOR AT DOWN-TO-EARTH PRICES." Being nepotistic, I hired our favorite Chicago model, my wife Caryn. Here is a photo taken, a fun one, where they stuck me in front of the lens. A smoke machine was churning out the mist; the background was simply a black seamless piece of paper with pin-prick holes that was back-lit. Note the plastic gun. This was done before Photoshop, so all retouching was done by hand. The retouching artist wore jewelers' glasses when working!" 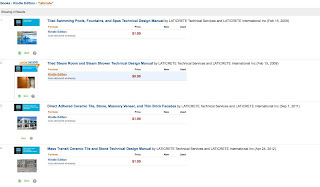 Additional Laticrete Technical Design Manual Books are now available for the Amazon Kindle. 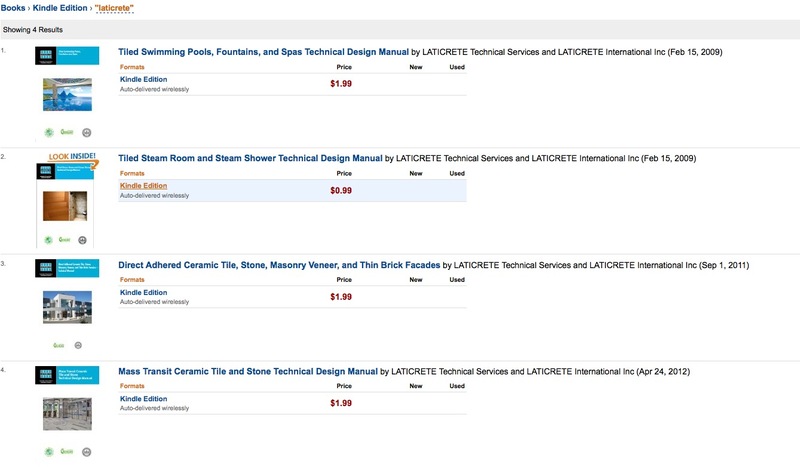 The goal of these in-depth Technical Design Manuals is to assist the tile contractor, tile installer and the design professional in assessing, selecting and specifying installation materials, methods, technologies and system for tile and stone installations in specialized application areas and facilities. 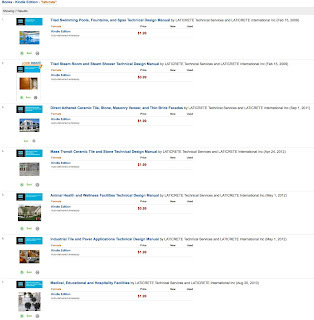 These manuals contain in-depth design and technical information as well as libraries of Architectural Details. 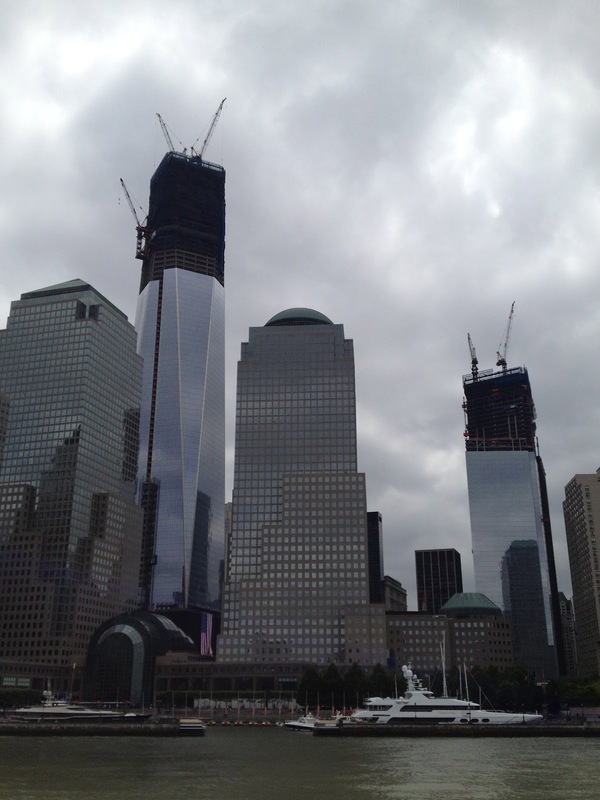 The details are also available in electronic CAD file formats. 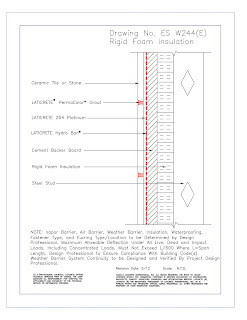 The installation methods reviewed are supported by an online detailing and specification tool located here. 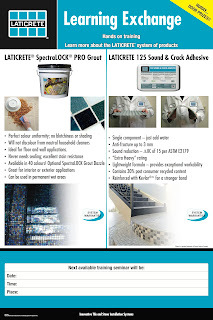 Our recommendation to the Owner's Management Team is that they consider a "Total Laticrete System Approach" rather than our chemical resistant epoxy grout and our strong, flexible thinset adhesive mortar with another company's mat & membrane products"
We proposed a total Laticrete system from the waterproof membrane to the thinset to the grout for "Single Source Responsibility" and a system of proven compatible products for this restaurant kitchen's tilework.